In great condition for its age (see photos). LANGLEY DENBY MAYFLOWER. 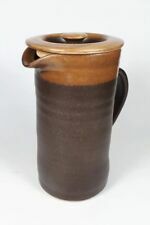 large brown pottery coffee pot in excellent condition. WITH MILK JUG AND LIDDED SUGAR BOWL. 1 1/2 pint COFFEE POT. grey / yellow Mint condition Never been used. GREY AND YELLOW DESIGN. 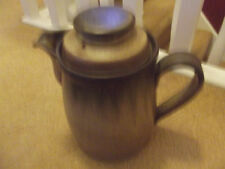 COFFEE POT BOURNE DENBY ENGLAND 23"
BOURNE DENBY ENGLAND. COFFEE POT. USED VERY GOOD CONDITION. Condition: Previously owned very good. Denby Images coffee pot in Excellent condition with no chips or cracks.It measures 19.5cms to the top of the pot excluding the lid x 10cms diameter across the top of the pot, and when full holds 3 pints. Any further questions please ask.Collection is welcome if required. Denby Greenwheat Coffee Pot. "GREENWHEAT". Coffee Pot. in one of their most iconic designs of the 1950s/70s. Ideal to replace those broken or missing pieces or add to your existing service. It still has it's original sticker on it. LID ONLY, NO COFFEE POT IN THIS SALE, THE LAST PICTURE IS JUST TO SHOW WHAT IT FITS. 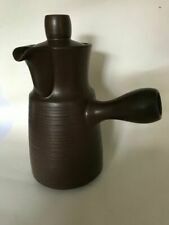 Denby Wheatsheaf pattern coffee pot in excellent used condition, lovely piece. Denby Greenwheat - coffee pot/hot water jug with lid. GREENWHEAT 1 PINT COFFEE POT. THIS COFFEE POT IS IN VERY GOOD CONDITION, WITH ONE VERY TINY CHIP ON THE INSIDE OF THE LID. Denby Romany Large Coffee Pot 7.5"
10cm across X 6½cm tall. 14½cm across. We are Platemates, the china matching agency for discontinued china. Denby 3 Pint Coffee Pot / Hot Water Jug. Great addition for your collection. Denby Langley Canterbury. Coffee Pot with Lid. Very Good Condition. Holds approx 2.1/2 pints. Small manufacturer imperfection see last picture. There is a chip under the pot,non visible. Wear to gilding on the handle. O verall g ood used condition. Poole Pottery Twintone Mushroom / Sepia Dinner Plates x 4 (#201614890509) £15.99 View Item. MASONS VISTA CRESCENT DISH (#201588338655) £21.99 View Item. This is a lovely Denby stoneware coffee pot in the Midnight pattern. Item Condition: It is second quality but in good condition. No cracks or crazing, but there is a small chip to spout as pictured (only visible if inspecting very closely). 8cm across X 14½cm tall. It is back stamped with the diamond shape Bourne logo which dated this to about 1926. and is also stamped 1 pint. We are Platemates, the china matching agency for discontinued china. In Denby Echo Blue. made by Denby between 1963-1974. A One and half Pint Water / Coffee Pot. It is earthenware slip glazed with an attractive beaded pattern. As well as the bottom pottery mark there is an anchor shape stamped into the upper surface of the lid. See photo 11. Tigo Ware Kave coffee pot c.1956. Designed by Tibor Reich.